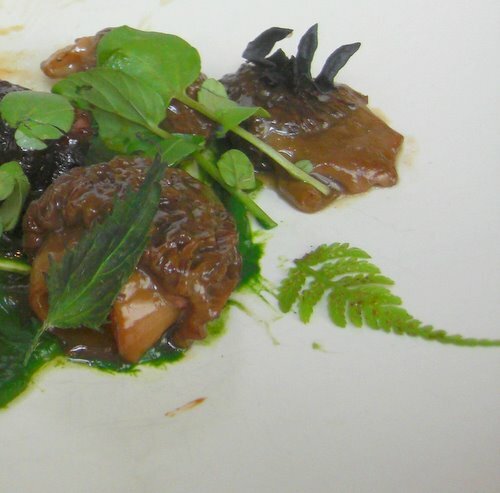 has been named one of the USA’s Best New Chefs 2010 by Food & Wine Magazine. The tasting menu is $55, a snip. 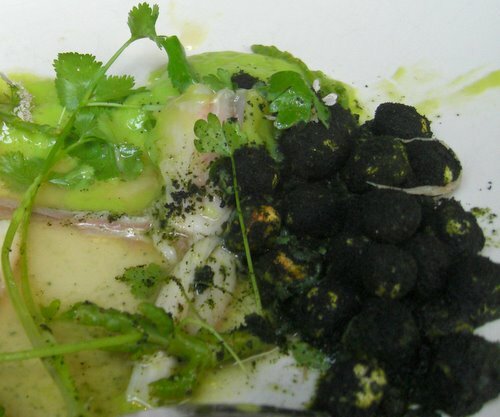 Some customers seemed unsure about the concept of a tasting menu and were unsure whether they could eat four courses – perhaps thinking it would include 4 substantial servings. There were 5 choices for each course. The cooking is innovative and different and difficult to categorise: It showcases amazing local ingredients and quite a few that were new to me. So we could try as much as possible, Mr EF kindly had a different dish to me for each course. The titles of the dishes are were provided on the menu complete with the terse title from the menu. First Course: Pickled early strawberries, bison tenderloin, herbs and malt. Mr EF was very pleased with this combination, the green strawberries having a subtle taste, the malt really accentuating the flavours. The star of all the dishes perhaps. 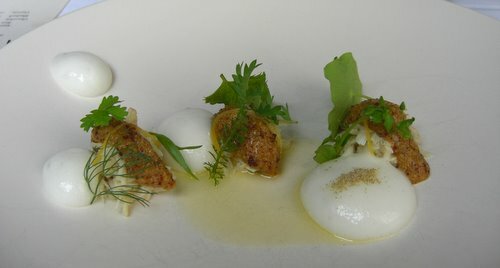 Foams are so over-rated, but the lemon and cardamom beautifully complimented the buttery crab topped with amaranth which added a little texture. 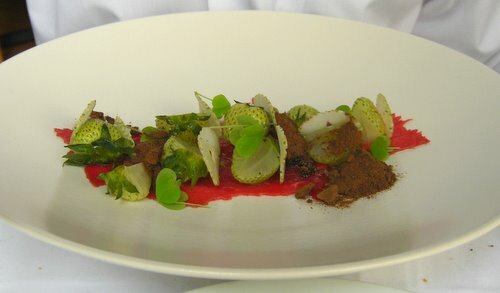 2nd Course: Early sour plums in vinegar, salted plum, pig tail and sprouts (tiny vegetables rather than brussels). 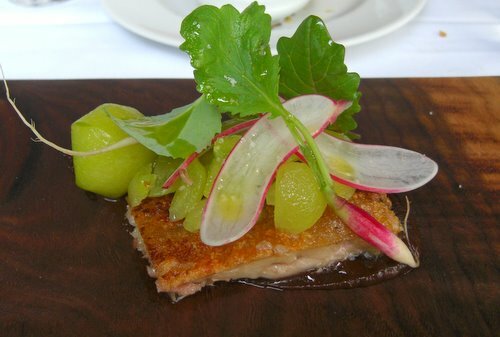 For a crackling lover such as myself this was heavenly: crisp skin, melt in the mouth pork accompanied by diced sour plums. We were instructed to eat the larger sour plum as a mouth cleanser at the end: it really worked! Course 2: Pickled (meat) marrow, porcini, spring garlic, pine nut, coffee and cocoa. 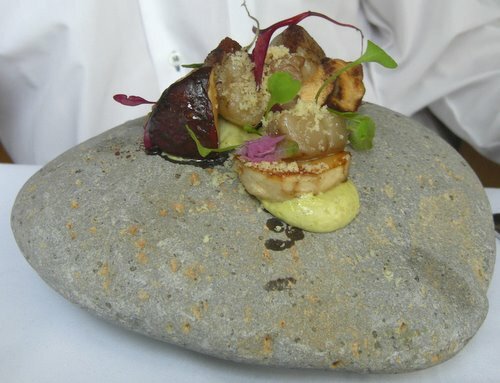 Definitely the most astonishing dish – apparently they have stones of all shapes. This is a BIG stone. Mr EF reported the porcini and marrow mixture a perfect balance and the coffee and cocoa enhancing the overll flavour. The lamb was unctuous, slow cooked then coated in a BBQ sauce glaze, the greenery added a light touch. Course 3: Fresh Oregon skate, fresh garbanzos, salcornia (samphire) and seaweed infusion. The only dish out of the ones we tasted that didn’t have the wow factor. The garbanzos were covered in a very salty powder. 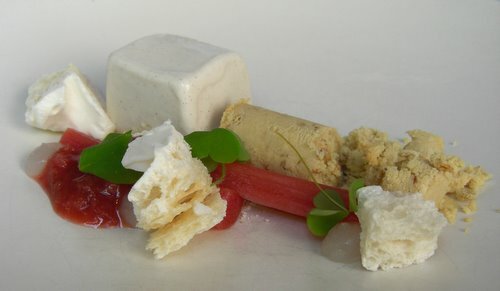 Course 4: Oats, rhubarb jam, vanilla, olive oil bar and violet. Mr EF was licking his lips. Course 4, Dish 2: Bavarian malt, sorbet, sable, curdled cream and lemon balm. 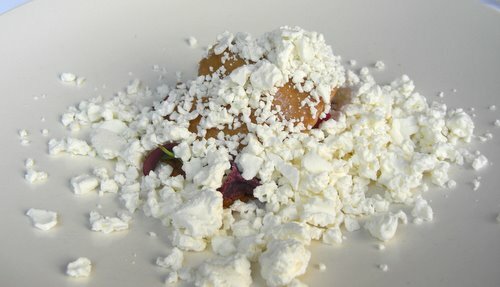 The curdled (frozen) cream covers candied beetroot (deliciously chewy) with subtle sorbet, enhances with a little malt. Which dishes would you have gone for?